Okay, to be totally honest, I forgot I was hosting. I knew I was hosting on May 20th, but it just seemed unreal that it could ALREADY be May 20th. I’ve definitely taken on too much as of late; my body has been clear about that. It’s a matter of figuring out how to juggle and getting through lots of personal and work stuff. Speaking of work stuff, I’ve got a new newsletter on healthy-ish GF products. Check it out! Our theme this year is garden grown. 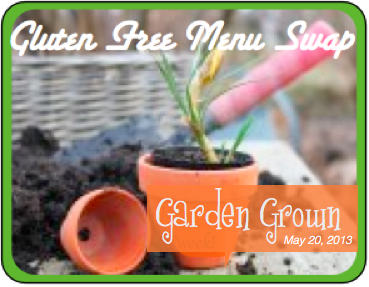 If you’re interested in hosting for future weeks, go see Heather at Celiac Family for the details for future weeks! I’ve been quite pleased with how the garden is growing. It seems that our “guard foxes” deter deer. But the foxes haven’t been seen in a few days, so…deer, if you’re reading this, the dude at the corner of Karmich and 286 has a much nicer garden. Go there instead. Thanks much. Right now, we’ve got kale, garlic scapes, carrots (only carrot tops right now), and a little bit of stevia which was so kind as to re-seed itself. I’ve never had that happen before, so I’m grateful! We’ve al so had a lot of the perennial herbs (thyme, rosemary, oregano) out in full force. So…because to be 100% honest, I didn’t plan this week out fully, and if I said I had a firm plan, well…I’d be lying. Rosemary salmon (for my birthday!) Yahooza! Melissa at Mom’s Plans is balancing delicious and budget. She’s got a tuna casserole on the menu that looks delicious. Heather of Celiac Family has some herbs growing in an Aero garden. As usual, she has a pictorial food plan, which I love and my eyes went right to the Pigs in a blanket. I haven’t had those in forever (give or take) and I used to love them. What fun! Angela of Anglea’s kitchen has rhubarb! I am quite envious; I’ve always wanted some, but supposedly we’re too far south here in VA. She’s also got ribs on the menu that look delish. Sounds like a delicious week! I need to roast onions. That’s what’s been missing in my life. Thanks for hosting this week. I need to try Rosemary Salmon, sounds great! I’ve got my menu posted at http://celiacfamily.com/?p=7946. The foxes are too cute, but glad they aren’t in my yard! My chickens would not like it one bit – LOL!